This year, the government of Kenya declared a national drought emergency with 23 out of the 47 counties marked. The Northern part of the country was most affected, which also experiences perennial drought. The drought often threatens both health and local food security. The current situation has left over 2.7 million people food insecure and exposed to malnutrition and other related conditions. Lack of clean drinking water has also advanced the risk on their health and sanitation. Kenya Red Cross Society has chosen to change their mode of response from the usual food relief and water tracking done by many humanitarian organizations. The focus now being to educate the affected communities to adopt sustainable farming for food security. Epicenter Africa has partnered with Kenya Red Cross to design and install solar powered borehole systems for irrigation. By rehabilitating existing boreholes and setting up community irrigation farms, the communities are able to produce food crops throughout the year. They are also able to obtain clean drinking water for their families and livestock. The current project we are working on in Waldaa area, Marsabit County will see four communities food secure in the coming seasons. The boreholes are able to deliver 300,000 litres of water daily, putting 65 acres of land under drip irrigation. Solar power systems will ensure a constant water supply to the farms daily with no running or maintenance costs to the farmers. 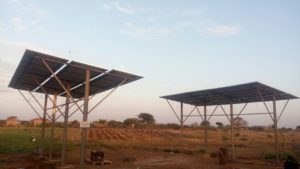 Epicenter Africa is happy to be part of this noble cause with successfully commissioned systems in Olla and Chachabore, Wajir County and several other farms in Garissa County. This is providing a sustainable solution to the water and food challenge and preparedness for the adverse weather conditions often experienced in these regions.